Gamestop is offering up a hell of a deal right now, at least it seems like a good deal. 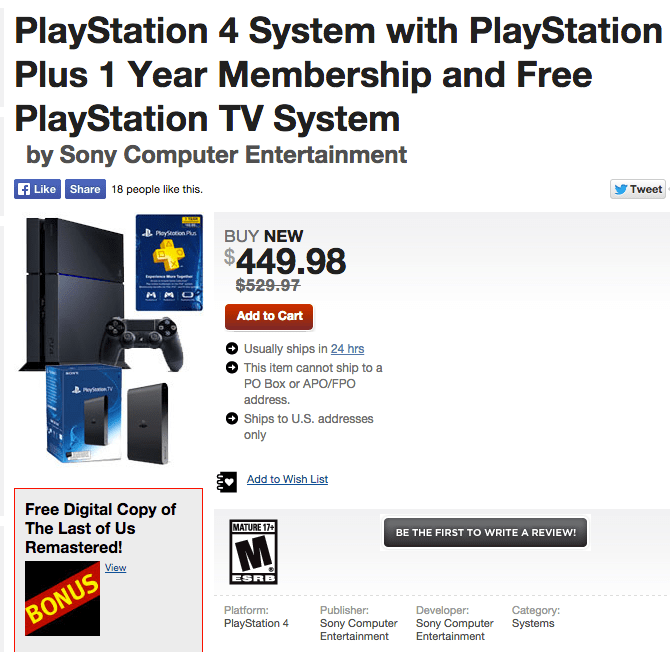 Buy a PlayStation 4 (a new one) and 1-year of PS Plus, the subscription required to play online games on PS4, and you’ll also get a FREE (that’s right, free, as in, no fundage required) PlayStation TV. While personally I think the PSTv doesn’t do enough for my own needs, some people really enjoy the functionality of the PSTv and if you’re in the market for a PS4 it’s a worthwhile decision to grab one at GameStop and take advantage of the deal. You’ll also get a digital copy of The Last of Us Remastered as well, which has been an included deal for new PS4 purchases for some time now. Props to my friend @thehugofwar for the tip! Rocket League – 2nd Beta Now In Motion! Ep12 – *Disclaimer* Day One Editions yay or nay?